1) Girls on a bike at a fair show are a very kitsch matter, an insult to feminism and an affront to men’s intelligence. But they are pretty to watch. 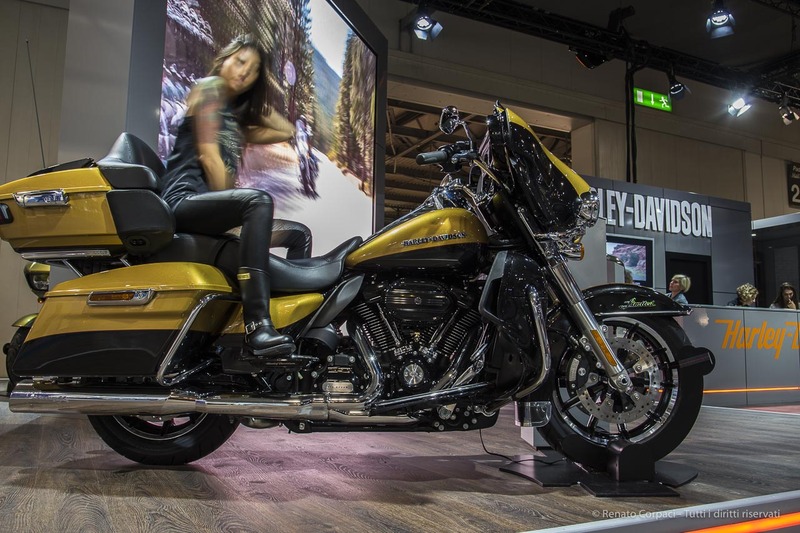 A tour of EICMA, the major bike show in the World (November 10th through 13th). 2) People at a bike fair are rather aged boys rather than not. With noumerous exceptions. 3) Japanese bikes are perfect machines to ride but they lack allure. 4) Zero emissions, zero gasoline: Zero Motorcycles from Santa Cruz, California. 5) What does a line-up of hams do at a bike show? It’s a cabinet maker specialized in garage furnishing and tools (Lv8) trespassing into kitchen territory. 6) MV Agusta are awesome objects. I’d love to keep one in my living, they make wonderful works of art. 7) Guzzi – more of the same thing – still exerts a special fascination on an elderly crowd. 8) Vespa is a Pop Art masterpiece. 9) Moto Morini has still something to say. 10) Osram, more light is fine, but what about all those rearview mirrors? 11) Off-road is a youngsters’ domain. 12) BMW: change everything in order for nothing to be changed. 13) Harley Davidson: The Call of the Wild.